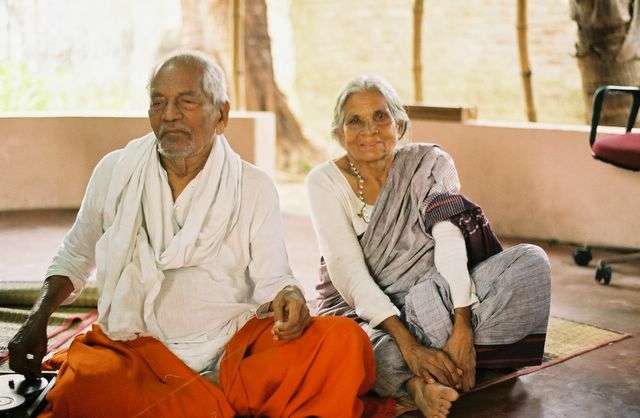 David Albert and Aliyah Shanti India Log: Krishnammal Coming to the U.S.! Krishnammal Coming to the U.S.! Oh, my! Two years gone by, and there is so much to post! Well, let's start with the most exciting news first. Amma, together with P. Gandhi and Vengopu, are coming to the U.S., with LAFTI having been named finalists for this year's Opus Prize! Padmashri Krishnammal Jagannathan and Land for Tillers Freedom (LAFTI) has been named as a finalist for this year's Opus Prize, which will be awarded in Seattle at Benaroya Hall on Tuesday evening, November 18th. "Currently in its fifth year, the Opus Prize is a $1 million faith-based humanitarian award and two $100,000 awards given annually to recognize unsung heroes working on the front lines of today's most persistent social problems. Opus Prize winners combine a driving entrepreneurial spirit with an abiding faith to combat social problems, including poverty, illiteracy, hunger, disease and injustice. The monetary awards are granted to organizations in honor of the Opus Prize winner. Established to honor the innovative humanitarian work of those dedicated to helping transform the lives of people facing a future with little or no hope, the Opus Prize recognizes and supports the winners' extraordinary life commitment to life-changing work. Beyond supporting the humanitarian efforts, the Opus Prize aims to inspire people to pursue service to others." So we are busy setting up a national tour for in the month prior to the award ceremonies, with events thus far planned for Boston, Philadelphia, Washington DC, Raleigh NC, Greenville, SC, , San Diego, the Bay Area (San Jose/San Franciscio), and finally in Olympia/Seattle. They will arrive in Olympia the morning of the November 13th. Meanwhle, Friends of LAFTI Foundation has become a 501(c)(3) charity with a very nice website put up by Randa Blanding - www.friendsoflafti.org and we are working to help build 10,000 houses alongside LAFTI's efforts at land reform for Dalit women. The founders and leaders of LAFTI, S. Jagannathan and Krishnammal Jagannathan, or as they are more commonly referred to by the people, "Appa"(Father) and "Amma" (Mother). Krishnammal and S. Jagannathan are the subjects of the new oral biography The Color of Freedom by Laura Coppo, edited by David H. Albert. All proceeds from the sale of the book through David Albert's website go to support LAFTIâs work. The London-based Environmental Justice Foundation has a website devoted to the global deleterious impact of prawn farming. Through the site, you can also access their excellent report âSmash and Grab: Conflict, Corruption, and Human Rights Abuses in the Shrimp Farming Industry."